We all have to proclaim and bear witness to the Gospel. In Godâ&#x20AC;&#x2122;s great plan, every detail is important, even the hidden witness of those who live their faith with simplicity in everyday family relationships, work relationships, friendships. (These) are the saints of every day. One cannot proclaim the Gospel of Jesus without the tangible witness of oneâ&#x20AC;&#x2122;s life. Those who listen to us and observe us must be able to see in our actions what they hear from our lips, and so give glory to God! ridget Brennan is the new director of the Ignatian Volunteer Corps in St. Louis, a Jesuits of the Missouri Province-sponsored ministry of retirees serving the poor while growing in Ignatian spirituality. She arrived on May 6. Brennan, 71, is the former executive director and founder of St. Louis Healthy Families, a nonprofit that did education, training and advocacy for healthy relationships. Before that, she created in 1986 and operated until 2004 a family life ministry at St. Francis Xavier (College) Church in St. Louis, including marriage education and relationship skills, spiritual direction and retreats. rother Lawrence Huck has been named the first staff president of The Good Shepherd School, a Jesuit Nativity school in New Orleans that works with at-risk, underserved children. Huck, 44, a native of New Orleans, taught high school theology at Jesuit High School of New Orleans and served as campus minister at Jesuit High School of Tampa. He also taught at Berchmans Academy of the Sacred Heart in Grand Coteau, La., only a short walk from St. Charles College where, for two years, he oversaw renovations for the New Orleans provincial. New Orleans and Missouri Jesuits on the Move Community in St. Louis by Fr. Don Highberger who has been overseeing campus ministry at Saint Louis University. Fr. Pat Quinn will become associate pastor of St. Matthew Parish in St. Louis; he has been minister of the Bellarmine House community and part of the Saint Louis University campus ministry program. Fr. Scott Hendrickson will join the faculty of Loyola University Chicago; he recently completed doctoral studies in Spanish Literature from Oxford University. Fr. John Lan Tran will begin tertianship in Portland, Ore., in the fall after having taught and done campus ministry at St. Louis University High School for four years. Andrés Vall-Serra will begin theology studies at Boston College School of Theology and Ministry. He did his regency in Managua, Nicaragua at the Instituto Loyola and worked at the Escuela de Guadalupe in Denver. Joseph Wotawa will begin regency at De Smet Jesuit High School in the fall. Sean Powers will begin teaching art at Regis Jesuit High School for his regency. search will begin this fall for a successor to Saint Louis University President Lawrence Biondi, who announced in May his intention to retire. Fr. Biondi, 74, arrived at SLU more than a quarter-century ago and is one of the longestserving presidents at an American Jesuit college or university. His tenure has been marked by campus expansion, construction and improvements; a 10-fold increase in endowment; and establishment of innovative initiatives such as the Center for World Health and Medicine and the launch of the first Center for Sustainability at a Jesuit university. Along the way, he was active in campus ministry and volunteered for student retreats while discerning a Jesuit vocation. In 2002, Navarro entered the Society of Jesus. He spent two years at the New Orleans Province novitiate, followed by philosophy and theology studies at Loyola University Chicago. As part of his regency assignment, Navarro taught at Houston’s Strake Jesuit College Preparatory and helped open the Cristo Rey school in that city. Following regency, he was missioned to the Jesuit School of Theology of Santa Clara University in Berkeley, Calif., where he earned a Master of Divinity degree. He includes among his memorable formation experiences his long experiment in Guadalajara, mission trips to Mexico City and a trip to the Philippines, his first visit to his parents’ homeland. The 53-year-old Navarro will serve at Immaculate Conception Church in New Orleans. losophy three years later. He did a threeyear regency assignment with National Geographic Television in Washington as a writer, producer and director, and contributed to documentaries on a lost Mayan civilization and the quest for King Solomon’s mines. In 2010, Zipple returned to Boston College to pursue a Master of Divinity degree at its School of Theology and Ministry while serving as a deacon at St. Joseph’s Parish in Belmont, Mass. He will return to Boston to continue work on his Licentiate in Sacred Theology. At 35, he hopes to continue making documentaries on Jesuit, religious and cultural themes. The Jesuits in Belize focus most of their energy on St. John’s College and two parishes: St. Martin de Porres in Belize City and St. Peter Claver in Punta Gorda. (Clockwise from lower left): The Centre for Community Resource Development (CCRD) helps young people in Belize City develop job skills. St. Peter Claver Parish takes in all of the Toledo District including many Mayan villages like San Vicente where Rockhurst University students spent their spring break in March helping build a teachers’ residence. Fr. Jesús Riveroll leads the Jesuits in a morning Mass at St. John’s College where Fr. Tony Vega serves as evening dean at the junior college and Bro. Glen Kerfoot teaches theology. Fishing boats bob in the Caribbean waters off Belize City. St. John’s College has steadily built up its classroom buildings and now accommodates nearly 1,900 students. Many Jesuit priests continue the long tradition of driving into the districts near Belize City to lead small congregations at Sunday Mass, including Fr. John Maher, who has been providing the sacraments to people in Burrell Boom for more than 20 years. Lay people such as Telésforo Paquiul, principal of the St. Peter Claver primary school, and teacher Tracy Ramirez play key roles in sustaining the Church’s mission. St. Peter Claver Parish church and Jesuit residence in Punta Gorda, Belize (top). Fr. Louis McCabe, pastor, (above) en route to one of two Masses in village grade schools; the first Mass of the day is at Indian Creek village (right). front of a concrete church building beneath a ridge blanketed by dense forest. Guatemala is less than a mile away. The catechists filed into church and knelt in prayer before starting. The women sat on rough-hewn wood benches on the left side, the men on the right. Only men were allowed to speak at the session, as is the case at all public meetings in the villages, but that didn’t stop the women from talking and laughing on the ride there. “What does it mean to be a Catholic Maya in my village in 2013?” Powers asked the group. He cited statistics showing that the number of Catholics in Belize has nearly been halved over the past 40 years, dropping from 70 percent to 39 percent. When he asked the catechists to explain the decrease, they offered that other denominations with fewer requirements for sacraments, for example, have entered the marketplace. Powers then focused on another statistic that said that Belizeans who claimed no religious affiliation made up the fastest-growing religious segment in the country. Powers suggested that perhaps the “no religion” group poses even more of a challenge to Catholicism than Protestant inroads. He asked the catechists to think about practices that Catholics take for granted. “Where are the men during a Catholic service?” he asked. “Outside the door, standing on the veranda. When you are standing outside the church, it is hard to hear the Word of God from the catechist.” Powers encouraged the catechists to speak in a way that is inviting and makes sense. He ended by asking them to reflect on “ways that our village churches can invite people in for Sunday worship, for leadership, for service projects.” After Powers finished his presentation, Chi spoke to the group in Ketchi for 45 minutes. He placed a statue of Our Lady of Guadalupe on the altar to reinforce the Church’s practice of remembering saints. Later, Chi noted that one of the catechists who had come from a village that removed church statues looked uncomfortable as Chi spoke. Primary school teachers are another key group. “They are an incredible fount of wisdom, ready to drop their guard and share what they have learned in their life experience,” said John Rogers, a Jesuit volunteer serving as director of retreat ministry for St. Peter Claver Parish in Punta Gorda. He spends much of his time offering one-day spirituality retreats for primary school teachers. His early-morning drives to the villages include pickups of people along the way. Rogers, who often starts the retreats with songs from the Catholic charismatic tradition, likes integrating spirituality into the rest of life and encourages the teachers to do the same. He finds the teachers very responsive and resilient, and sees them as leaders of their communities. Sean Powers (above) helps grade school students in Punta Gorda prepare for confirmation. Fr. Mo Murray (left) is assistant pastor at St. Peter Claver Parish. In January, four men had their throats slit. “There was panic, the city shut down like a storm was coming. It was eerie and weird,” Ruhl said. Law-abiding people tend not to go out at night any more, making normal parish routines more difficult. “In the whole Missouri province, this is the worst real estate,” far worse than metropolitan St. Louis’ most crimeridden neighborhoods, Ruhl said. Ruhl responded to the violence ravaging the city by organizing a 300-mile march along the length of the country to promote “a culture of peace.” “I wanted to start a peace movement by organizing the Bishops’ March for Peace, so that people would think about things that could be done to promote peace,” he said. He was especially concerned about St. Martin’s youngsters. The parish has 700 grade school students and 90 in its pre-school. Some students already exhibit violence. Many have absent fathers, and some of their mothers, out of economic necessity, have resorted to prostitution. Ruhl challenged his parishioners to take action. On Feb. 1, he led walkers from the Sarstoon River, the country’s northern border with Mexico, to the Toledo district bordering Guatemala. It took 13 days. Eight people made the entire walk. Others walked portions of the route. “The walk is more than putting one foot in front of the other for 300 miles,” said Tanya Usher, one of the organizers. Pavilion chapel, and the large crucifix that once hung in the college’s original main chapel is now behind the altar of the new place of prayer. Most of these Jesuits knelt before that very crucifix when they pronounced first vows decades ago. “So I end up where I started as a novice,” Kissinger, 98, said. When the elder men gather for meals, they are joined now by novices and other Jesuits who work at the college’s Spirituality Center, and nearby Our Lady of the Oaks Retreat House and St. Charles Borromeo Parish. At the traditional afternoon social hour, seniors gather in a specially designed area with comfortable seating, a small kitchenette and a serving counter, for hors d’oeuvres and conversation before dinner. Living quarters in the Pavilion are simple but comfortable with private bath, phone, cable TV and Internet connections and other amenities. For most of the men, views out their windows might bring back memories. The Pavilion occupies the part of the college that once housed the dormitory and dining room for the novices of yesteryear. from their former archives repository in St. Louis to the Midwest Jesuit Archives, a distance of a few miles. The Daughters recently moved their archives repository from St. Louis to a new facility in Emmitsburg, Md., where their religious community in the U.S. took root in 1809, and decided not to take the systems with them. Miros said the gift eliminates the need to purchase the systems as the Midwest Jesuit Archives grows its collection. At the May 5 dinner, Miros gave the Daughters a mounted, framed copy of a page from a mid-1800s Catholic almanac that cited Sister Olympia and her work. 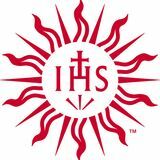 The Midwest Jesuit Archives collects, identifies, appraises, describes, organizes and preserves the historical records of the Chicago, Missouri and Wisconsin provinces and the Jesuit Conference. In July, 2011, four of the five U.S. provinces of the Daughters of Charity of St. Vincent de Paul merged into one based in St. Louis. They also decided to merge the archives of the four former provinces into one archives based in Emmitsburg, Md., the former provincial headquarters of the Southeast Province. The Daughters’ collections are in a new state-ofthe-art repository, complete with exhibit galleries and a reading room for researchers, spokeswoman Belinda Davis said. Take, Lord, and receive all my liberty, my memory, my understanding, and my entire will, all I have and call my own. You have given all to me. To you, Lord, I return it. Everything is yours; do with it what you will. Give me only your love and your grace. That is enough for me. n the swatch of notes that became the Spiritual Exercises, Master Ignatius wrote out only two prayers. The first one is a generous response to Christ’s epic battle to establish the Kingdom. St. Ignatius urges someone making the Exercises to pledge to live and labor with Jesus in a prayer that begins, “Eternal Lord of all things,” and ends with joining Him come whatever might. St. Ignatius suggests praying the second prayer after a quiet, great-spirited contemplation on self and all creation. That exercise is usually called the “Contemplation to attain the love of God,” but actually, it’s about learning to love the way God loves. The contemplation comes in the Fourth Week of the Spiritual Exercises as they focus on the Resurrection of Jesus. This second prayer is the Suscipe, or Take and Receive. St. Ignatius advises us to remember two things before the contemplation begins. First, that love is done – as Ignatius says, it “shows itself in deeds rather than in words.” And second, that love is always a mutual sharing between the lover and the beloved – giving and receiving, receiving and giving. With that in mind, I turn to see how God loves by going through the four moments of the contemplation. I consider that all that I have and am, even beyond what I can see, is God-given. Ignatius suggests reflecting on the incredible beauty and richness of God’s creation. I might remember places I have lived and people who hold a special place in my heart. And the point is that all these blessings are God’s gift to me. God gives and gives. So if I want to love the way God loves, I want to give. But what have I to give God who gives me everything? This is where the prayer starts. I can give God my love, a gift that has to be freely given. So I start: “Take, Lord, and receive my liberty, my memory, my understanding, and my entire will” – the core of myself. I say, “and receive,” asking the Lord to accept my love, knowing that God will. Then, consider that God does not give gifts the way we do: we give a gift and then leave. But God remains in His gifts. God is entirely present throughout the universe and in every molecule of all the worlds. Loving the way God loves requires doing the same. Giving one’s self to the Lord means giving “all that I have and call my own.” There’s more, because God is not “in everything” the way a color is on a wall. No. God is always active in His gifts, in the first place continually keeping them in existence as the Creator of all. Now, this is a stunning reality, because it means that everything I do, God does. So Jesus said that He “can do only what He sees the Father doing.” I may not see God “doing” with me, but “in Him we live and move” as well as have our being. Here is a wonderful truth: God gives me my very self, which I in turn am free to give back to God. So the prayer says: “You have given all to me. To you, Lord, I return it,” meaning my self. Amazingly, I am loving as God loves. The final consideration is obvious. If God gives Himself and keeps staying with me, God is sharing His Divine Self with me. Think of a mirror aimed at the sun. The mirror is full of blinding light, even though it has none of its own, because the sun shares its light, freely. It loses nothing by sharing its light – but its light is its very self, and it shares its light generously, freely, steadily. It’s like that with God and each of us. I am full of life that reflects God’s life. Every thing I do, God is doing with me, or really, it’s the other way around. (See why sin is so bad?) I think, and I share God’s infinite thinking. I act freely, and I share in the divine free action. I love, and I share in the God of Love, whom I love. Fr. Joseph Tetlow, an expert in Ignatian spirituality, is a writer, lecturer and retreat director in St. Louis. During his tertianship, Fr. Ross Romero (above, right) visited Ghana’s seacoast, where slaves were loaded onto ships for transport to the Americas. r. Ross Romero is back in Omaha, Neb., where he is on tenure track as a philosophy professor at Creighton University. But from January to late June, while on leave from his teaching post, he lived a world away in West Africa, first in Ghana, later in Nigeria, for his tertianship, the final phase of Jesuit formation when priests and brothers test, and hopefully, reaffirm their commitment to the Society of Jesus and feel ready to be invited to make final vows. He could have joined the American tertianship program in Portland, Ore., but he opted for the one in Ghana, in part, because Father General Adolfo Nicolás identified Africa as a priority for the Society, but also to spend time in a place that African Jesuit friends he’s made over the years call home. “There was no way I could really begin to feel and think with the African Jesuits without spending some time in their place and really seeing first-hand what the Holy Spirit is doing here.” Romero, 45, also would have missed the color and culture of a world away from the ordinary, and all the heart-stirrings that followed. Tertianship, after all, is a process that allows a Jesuit to step back from his regular work to pray, reflect and develop a deeper sense of self. In an email from Africa, he recalled a stranger extending Nigerian hospitality as he walked on a busy city street in Benin City, sensing all eyes on the rare sight of this white Western Jesuit. “A very dark man about my age walked up to me and said, ‘Welcome foreigner. You look beautiful to me. You are very welcome here,’” recalled Romero, still amazed by the gesture. “Later in my Examen, I thought back on this experience and thought that this is precisely the kind of Kingdom that Jesus is laboring to bring about. Wouldn’t it be great if we in the U.S. had that kind of response to immigrants?” His first stop was Cape Coast, Ghana, home of the English-speaking Jesuit tertianship in Africa, where he lived in community and studied the Society’s constitutions, worked with the poor and made the full 30-day Spiritual Exercises of St. Ignatius. He said he’s still “unpacking things” in his mind that the retreat stirred up, and that during the retreat, he was led through periods of encouragement, energy and inspiration as well as moments of darkness, isolation and fragility. Fr. Ross Romero gave a philosophy workshop to Jesuit novices at the novitiate in Benin City, Nigeria. An opportunity to reflect on sin and salvation arose with a visit to Ghana’s coastal “slave castles,” Europeanbuilt fortresses where abducted Africans were branded, chained, shackled and held for slave shipment to the Americas. “The horror of these places and the inhuman treatment is overwhelming,” he said. But there, Romero was able to consider parts of the Exercises that explore sin and the salvation that Christ’s passion and death provides. “What I understand now more clearly is that Jesus wants to expiate sin,” he said. “He wants, above all else, to take on for us the sufferings that we endure in this world, and he will do it whether we want him to or not because his love for us is so great. All I can try to do now is to try to help him in expiating sin in the mission of reconciliation, in and through the Society of Jesus.” During Holy Week, he worked at two poor parish outstations in Ghana’s capital, Accra, washing feet on Holy Thursday, and leading Good Friday Stations of the Cross through a neighborhood near a junk yard. At the Easter Vigil, he helped Fr. David Ogun baptize more than 50 people at a Jesuit parish there. “During the homily, Fr. David got carried away by the spirit and lots of people were dancing and singing throughout the church,” he said. “I found myself in a conga line with the altar servers dancing through the aisles!” For the second half of his experience in Africa, Romero traveled east to Benin City, Nigeria, to preach and direct retreats at the Jesuit Retreat Centre for lay people, women religious and Jesuit scholastics and novices. His Pentecost Sunday Mass drew more than 1,000 spirit-filled Nigerians, the largest single Mass he’s ever celebrated. “Lots of fun with the preaching,” he wrote. “I went over 30 minutes and they were happy.” Romero said he didn’t have time to explore other parts of Africa before returning to Omaha on June 22, but left feeling “that I know the Society of Jesus better for having come here.” Brooke A. Iglesias is editor of the Southern Jesuit in New Orleans. s an attorney for a refugee asylum project in south Texas in the 1990s, Fr. Michael Gallagher was often tapped by U.S. immigration authorities to represent the very people they were prosecuting whom they believed had a good chance for victory. They recognized the talent of the Georgetown University Law School graduate, whose passion for justice work was shaped by the 1960s fervor for civil rights as well as time in India exposed to poverty on a massive scale. Today, the 64-year-old Gallagher represents the interests of refugees around the globe as the Jesuit Refugee Service’s representative to the United Nations in Geneva, Switzerland. No longer in the field among 43.7 million displaced people living in desperate conditions, Gallagher spends much of his day in his Geneva office, reading reports and policy papers and monitoring developments, especially those related to armed conflict in the countries JRS serves, or, as in the case of Somalia, where some of the refugees it serves in Ethiopia and Kenya come from. In 2001, after having completed master’s work in refugee studies at Oxford University, Gallagher was assigned director of JRS initiatives in Zambia. In 2006, he was named Southern Africa regional advocacy officer for Angola, the Katanga Province of the Democratic Republic of the Congo, Malawi, South Africa and Zimbabwe. He was assigned to his current position in 2009. In his Africa days, he would post news from various countries to the refugee camps via satellite phone so that displaced persons could track developments in their home countries. Before his work with JRS, Gallagher was an attorney with the Las Americas Refugee Asylum Project in El Paso, Texas, and was the provincial’s assistant for social and international ministries. In the late 1980s, he directed the poverty law center at Loyola University New Orleans. Today, on infrequent trips out of the office, he trains field worker teams in the nuances of international humanitarian and human rights law to assist in their advocating on refugees’ behalf. change. Refugees helped in either case all share the need for community, safety and basic human rights, he said. Last December, Gallagher, writing for the UNHCR, dissected the parable of the Good Samaritan to answer the questions of “who is my neighbor?” and “who must I love as myself?” “The victim’s circumstances, apart from the fact that he is traveling to Jericho, are not known,” he wrote. “The only real consideration is responding to the needs of a neighbor.” Gallagher said the parable compels everyone to reflect on who needs help, what type of help is needed, and “how complete” that assistance should be. The Good Samaritan, in his model of accompaniment, completely restored the traveling stranger he found suffering. For the millions of refugees who need help, the work of Gallagher and his JRS colleagues is a sign of such hope. Brooke A. Iglesias is editor of the Southern Jesuit in New Orleans. cott and Kathleen Hummel were convinced they could make a difference in the lives of a special population of kids in St. Louis. Young, and with only a few years of professional work experience between them, the recent masters in social work graduates were smart and idealistic. But they needed a mentor and networker to help them launch a nonprofit that would fill a hole in services for abused and neglected kids in St. Louis. Kathleen Hummel, who worked with adolescent girls abused a decade earlier, saw firsthand the effects of having carried that burden and trauma in their formative years. The couple dreamed of starting an organization dedicated to intervening early in the lives of such children. They found that support in Fr. Bob Weiss, who, 20 years after helping the Hummels start Our Little Haven as a founding board member, is still providing wisdom, guidance and support. The 88-year-old Missouri Province Jesuit was honored April 14 with the Our Little Haven Heart and Soul Award for his “extraordinary vision, leadership and service for those in need” at the agency’s 20th anniversary celebration in St. Louis. Back in the early 1990s, Weiss’ involvement was pivotal: he introduced the couple to potential donors and supporters; he found them a building and negotiated a purchase despite their lack of funding and credit; and he lent his name and credibility to their project, becoming the Hummels’ “Good Housekeeping Seal of Approval,” Scott Hummel said. “It was (Weiss’) spheres of influence,” he said. “He’d walk into a room and we’d tag along and meet people we might not otherwise have met,” he recalled. “We were trying to buy a building with no money or credit. We didn’t know what the hell we were doing. We were a bunch of idiot kids but little sparkles would happen.” Hummel said Weiss also set the tone for Our Little Haven with a comment that still resonates. “We can’t afford to think that we’re bringing Christ to these kids,” Hummel recalled Weiss saying. “In fact, Christ’s face is behind those tears that the kids are bringing to us.” “It really established who’s serving who,” Hummel said. Weiss’ relationship with the Hummels goes back at least as far as the 1980s when young Scott Hummel and his father drove to Kansas City, Mo., to check out Rockhurst University as a possible place for Scott to attend college. Scott Hummel’s father was a St. Louis University High School graduate and knew Weiss. So when the men showed up on campus and ran into Weiss, the then-university president gave them a tour. They’d have subsequent encounters. Weiss said he had “lots of dealings” with Scott and other members of a fraternity party house just off campus. And when Weiss visited St. Louis, he’d stay with Scott’s parents. José Fetzer, a native of Peru who spent part of his formation and studies in St. Louis, died Dec. 22, 2012, in Atlanta after 17 years as a Jesuit. He was 52. Fetzer entered the Society in 1995, studying at Creighton University in Omaha, Neb., and at Saint Louis University, where he earned a bachelor’s degree in Spanish in 1999. He served as the scholastic assistant to the rector of Bellarmine House in St. Louis, organizing community work schedules, duties and projects during his third year of studies there. He taught Spanish in Dallas and earned a Master of Divinity in 2006 from Weston Jesuit School of Theology in Cambridge, Mass. He was ordained in 2008. He did retreat work at Montserrat Retreat House in Lake Dallas, Texas, and more recently at Ignatius House Retreat Center in Atlanta, where he was working when he died. Robert Ratchford died March 29, 2013, in New Orleans after 64 years as a Jesuit. He was 88. The Firesteel, S.D., native served in the Army Air Corps as a B-29 gunnery instructor before entering the Society in 1948. He was ordained in 1961. He had a doctorate in chemistry from Catholic University and did post-graduate work in solid state electro-chemistry in West Germany. At Loyola University New Orleans, he taught chemistry, and was director of alumni, acting academic vice president and provost, dean of arts and sciences, and assistant academic vice president. He also served the New Orleans Province as executive assistant and catalog coordinator. He was a chaplain in the Civil Air Patrol and had received a commendation for flying a sick child to Philadelphia for medical treatment. He also had been a chaplain at Loyola New Orleans and the Jefferson Parish (La.) Correctional Center. Thomas “Dutch” Jenniskens died May 22, 2013, in New Orleans after 69 years as a Jesuit. He was 86. The New Orleans native entered the Society in 1943 and was ordained in 1956. In 1970, he earned a Master of Education in counseling from Loyola University Chicago. He taught high school in New Orleans and at the minor seminary in Corpus Christi, Texas. He served as rector of St. Charles College; was a teacher, counselor and chaplain at Strake Jesuit College Preparatory in Houston; and was a retreat director at the Jesuit Spirituality Center in Grand Coteau, La. He also gave much time and attention to the grounds of St. Charles College and to making ceramics. Walter Watson died May 29, 2013, in Denver after nearly 54 years as a Jesuit. He was 77. The Chillicothe, Mo., native entered the Society in 1959, and was ordained in 1970. He earned a master’s degree in European history from Saint Louis University in 1965 and taught high school history and theology in Denver, Wichita, Kan., and St. Louis, demonstrating patience with students who didn’t share his love of history. After a brief administrative assignment at Fusz Memorial in St. Louis, he was assigned as associate pastor for parishes in Colorado and Missouri. He is remembered for his kindness and humor; simple, thoughtful homilies; and generous giving to others. He maintained close connections with his fellow Jesuits. He was a member of the Xavier Jesuit Community in Denver. Many of us feel compelled to make a difference and leave a lasting impact on the people we love and the world we will leave behind. The search for significance and the desire to plan for the future lead many to ponder their legacy. The following people have been permanently enrolled in the Jesuit Association and are remembered in the prayers and works of the Jesuits of the Missouri Province. You can connect to the Jesuits every day. Visit www.jesuitsmissouri.org for news, profiles of your friends, media and back issues of the Jesuit Bulletin. l e g acy will yo e? 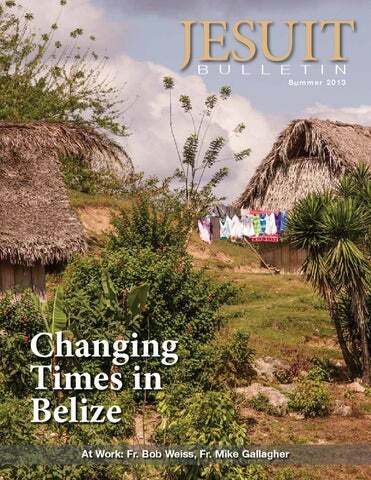 Jesuits in Belize accompany people in urban and rural areas to face difficult transitions.